The Katzenstein Distinguished Lectures series continued in Fall 2016 for its 19th year, with an October 28, 2016 lecture by Professor Leon N. Cooper of Brown University, entitled “On the Interpretation of the Quantum Theory: Can Free Will And Locality Exist Together In The Quantum Theory?” Professor Cooper shared the 1972 Nobel Prize in Physics with Professors J. Bardeen and J. R. Schrieffer. The Nobel Prize was awarded for the first microscopic theory of superconductivity, now known as the BCS Theory. Superconductivity as evidenced by the disappearance of electrical resistivity was first observed in Mercury by Kamerlingh Onnes in 1911. Immediately, many theorists including Albert Einstein, set out to explain this newly observed phenomena. However it was not until 1933 that the essential property of magnetic flux exclusion was observed by Meissner and Ochsenfeld. No successful microscopic theory was developed until the 1957 Physical Review Paper that developed the BCS theory. A crucial element for the theory was published in a short letter to the Physical Review in 1956 by Leon Cooper, entitled ‘Bound Electron Pairs, in a degenerate Fermi Gas’. These pairs are now commonly referred to as ‘Cooper Pairs’. 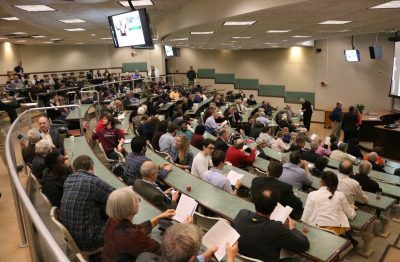 The 2016 lecture took place in Physics Building Lecture Room P-36, and an excellent attendance included physics undergraduates, graduate students, faculty from Physics and other departments, and a number of UConn Physics alumni. 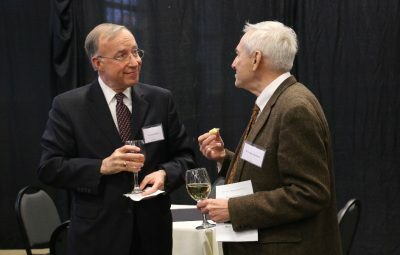 Prior to the lecture, Professor Cooper met informally with Physics students in the Physics Library, and then met people at a reception that preceded the lecture. 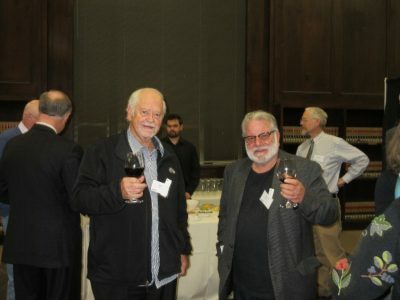 Following the lecture, Professor Cooper joined with Henry Katzenstein’s son David, a Professor at Stanford Medical School, along with faculty, staff, alumni and guests for a gala dinner at the University of Connecticut’s Foundation Building. 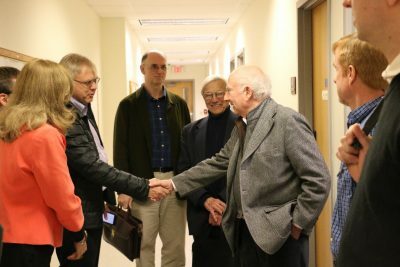 The Katzenstein Lectures are made possible by an endowment established by the late Dr. Henry S. Katzenstein and his wife Dr. Constance A. Katzenstein. 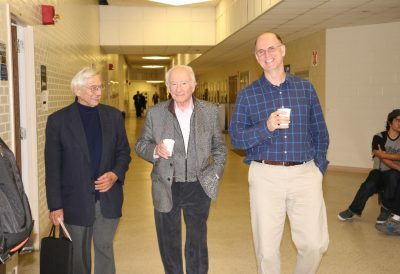 Cornell Professor David Lee (1996 Nobel Laureate in Physics and 1956 M. S. alumnus of UConn) gave the first lecture of the current series of annual lectures by Nobel Laureates, in 1997. Henry Katzenstein received the very first Ph.D. in physics from our Department in 1954 after only three years as a graduate student here. This story was published in the University of Connecticut 2017 Annual Newsletter. On Monday, August 21, 2017, the moon eclipsed the sun across the US. What began as a small organic outreach activity blossomed into an epic community event. With help from UConn communications, the UConn Physics club, and staff in the physics department, astronomers Jonathan Trump, Cara Battersby, and Kate Whitaker hosted an eclipse viewing event open to the public. Solar projectors, solar glasses, and solar telescope drew and estimated 2,000 visitors, including many children and families to share in the majesty of the heavens. To read more about the great American eclipse, read the recent UConn Today article by Elaina Hancock, featuring commentary by astronomers Trump and Cynthia Peterson. Whoever said rules were made to be broken wasn’t a physicist. When something doesn’t act the way you think it should, either the rules are wrong, or there’s new physics to be discovered. Which is exactly what UConn’s Connor Occhialini ’18 (CLAS), an honors student majoring in physics and math, found when he began researching scandium fluoride. Scandium fluoride is a transparent crystal with a cubic shape, a byproduct of mining. It’s not used commercially and it wouldn’t be particularly interesting to anyone except for one odd thing: it shrinks as it warms. Most materials swell as they heat up. Really simple materials like hydrogen gas swell because the heat makes their atoms zoom around faster, bumping into each other more, so the same number of hydrogen atoms need more space. More complicated materials also swell, which is why your wooden front door tends to stick in the summertime. But solids like wood can’t swell as much as a gas because their atoms are tightly linked together into long, interlocked molecules, so they just jiggle around, swelling the door a little bit. Scandium fluoride must be doing something else, reasoned Occhialini. His advisor for his honors physics project, Jason Hancock, had been working with scandium fluoride, and asked Occhialini to study a model of the crystal’s dynamics. Scandium fluoride has a pretty simple structure: it’s a solid crystal, with each scandium atom surrounded by six fluorines to make stacks of octahedra (eight-sided diamonds). The researchers hoped the simple structure might be easy to understand. Understanding scandium fluoride’s strange ‘negative thermal expansion’, as physicists call the heat-related shrinkage, might yield more general insight into other, more complex materials that do the same thing. Each black diamond represents a molecule of scandium fluoride. The scandium atoms (blue dots) are at the center of each diamond, and a fluorine atom is at each corner. Most of the time, bonds between atoms are flexible. So in a normal crystalline solid – calcium fluoride, for example – the fluorines and calcium atoms would all be able to wiggle around independently when the material warmed up. As they wiggled, they’d take up a little more space, and the solid would swell. Normal solid behavior. But Occhialini wondered if maybe that wasn’t what was happening in scandium fluoride. Maybe in this model, he should assume the bonds connecting each fluorine to its scandium were stiff? So stiff the fluorine-scandium bonds don’t move at all, so the diamonds are like solid blocks. The only places the structure would be able to flex when it warmed up would be at the fluorine atoms, which would act like tiny little joints. As the crystal heated up, the little scandium fluoride blocks would tilt around the fluorines at the corners. That’s what you see happening in the picture. You’ll notice that when the diamonds tilt, the whole structure gets smaller. It actually tightens up. The blue outline shows the structure at its coldest, perfectly ordered state, with no molecular motion. When the diamonds tilt, they take up a smaller total volume than the blue outline delineates. This is negative thermal expansion. Occhialini figured out that you can describe this shrinkage mathematically, using just the angle of the molecules’ tilt. He called the angle Θ (theta). When the scandium fluoride blocks tilt by an angle Θ, the distance between the center of each block shortens by a factor of cosine Θ, and the crystal’s total volume shrinks. To calculate that shrinkage (or, in a normal material, expansion) in detail, Occhialini added a third term to the classic equation that describes the energy of a vibrating crystal. The first two terms in the standard equation describe the potential energy a crystal has from the bending at each molecular junction, plus the kinetic energy of rotation of each molecule. Occhialini’s equation also describes the translational kinetic energy of the molecules–not just from rotating around, but also moving toward and away from their original positions as they rotate. The further they are from the center of mass of the crystal, the more they move. Look back at Figure 1 and notice the dot in the middle; that’s the center of mass. The diamonds in the middle barely move in relation to it, while the diamonds at the edges move a lot. Now imagine how much of a difference there would be if the crystal had millions of molecules instead of just 25. And now you understand how important that third term could be to the energy of the crystal. Each turning of the spiral is exactly the same distance from the last. That spacing – the distance between turns – is controlled by Θ. Imagine a line that stretches from the center of the sphere to a point on the spiral. The angle between that line and the pole of the sphere is Θ. You see the little ball traveling along the spiral? That’s the end of the imaginary line. As Θ gets bigger, the ball moves towards the equator. Imagine that the ball represents the instantaneous state of the scandium fluoride crystal – the physicists calculated the statistical average of what every molecule in the crystal is doing. You’ll notice the ball spends more time near the equator of the spiral sphere, that is, it tends to hang out where Θ is large. If the temperature of the crystal drops and the molecules wiggle less, Θ gets smaller, the more time the ball spends near the pole of the sphere and the less the crystal shrinks. So not only can a really weird phenomenon of a crystal that shrinks as it warms be explained by just assuming the molecules are rigid, but it can be illustrated with a classical geometric shape! Occhialini was just a freshman when Hancock introduced him to the scandium fluoride puzzle. He had to learn the math as he went, but after about two semesters of working on it he’d figured out the equation that described what was going on. Now in his senior year, he says his research experiences in Hancock’s lab have been integral to his experience as an undergraduate. The equation works beautifully and explains certain aspects of Hancock’s experimental x-ray measurements as well. “I learned a lot more doing research than any course could have given me,” Occhialini says. And now you, dear reader, have learned a little bit, too. Occhialini’s research has been funded through his advisor’s NSF grant no. DMR-1506825 and a SURF fellowship from the Office of Undergraduate Research. He was also named a Treibick Scholar. Please join the Department of Physics at UConn for a Solar Eclipse Viewing Party! From our location, the solar eclipse begins at 1:25pm and ends at 4:00pm. Maximum (partial) occultation occurs at 2:45pm. telescopes set up for the entire event. A spectacular and likely unforgettable show will take place in the sky Aug. 21. The reason she and so many others are excited for this event has a lot to do with its rarity. The last time a total solar eclipse was visible from the mainland United States was 38 years ago, in February 1979. 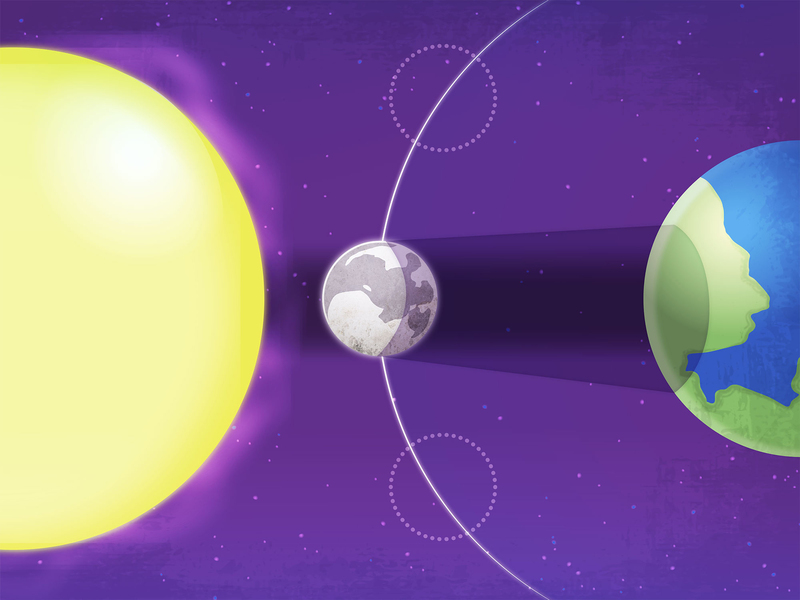 Very specific conditions have to be met to create an eclipse that can be viewed from Earth. The Earth and the moon must align perfectly with the sun as they speed through space, an amazing coincidence. To fully understand how this happens, Peterson says, it’s helpful to know some basic astronomy. The Earth moves in space around the sun, completing a full orbit once every 365.25 days, she explains. As the Earth and other members of our solar system travel around the sun, they continue in essentially the same plane, on a path called the ecliptic. Some celestial bodies, such as our moon, deviate from the ecliptic slightly. The orbit of the moon is inclined on the ecliptic plane at an inclination of 5 degrees. As the moon deviates 5 degrees above or below the ecliptic plane, it will cross the plane at points called nodes. The moon’s position in the lunar cycle is another vital eclipse component. As the Earth travels in its orbit, the moon tags along, keeping its gaze locked on Earth, always facing from the same side as it completes its own orbit around Earth once every 29.5 days. Over the course of a month, the moon’s appearance changes, from crescent to full to crescent again and finally to what appears to be its absence, when it’s called a new moon. A new moon is the other requirement for a solar eclipse. “The basic rule for a solar eclipse is to have a new moon at a node,” Peterson points out. But during an eclipse, how can our moon, which is relatively small, appear almost as big as the sun, which is pretty gigantic? So be prepared, and ensure you wear proper solar eclipse eye protection. Regular sunglasses will not help. Solar eclipse glasses can be used, welder’s goggles, or telescopes with proper lenses. Be sure the eye protection you choose is certified by the International Organization for Standardization (ISO). Other popular viewing methods are DIY viewing boxes like these. Peterson, like many others who wish to get the full eclipse experience, will be traveling to an area directly in the path of the eclipse’s shadow. These areas are called totality. The Aug. 21 eclipse will cover an expansive area of totality that will include 14 states and 14 major U.S. cities, stretching from Lincoln Beach, Oregon to Charleston, South Carolina. For a map of the path of totality, go to the NASA website. Connecticut is unfortunately hours of travel from the nearest totality. Peterson will go as far as Nebraska for the experience. 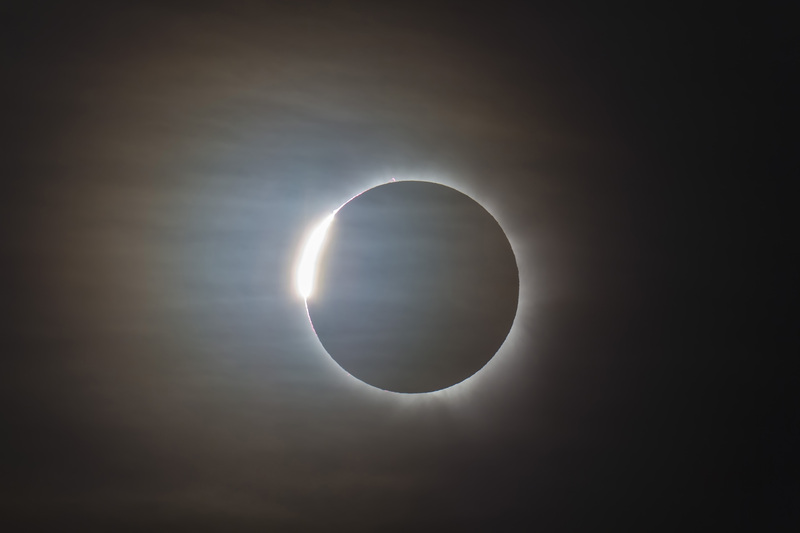 She encourages those who can to try to travel to a viewing point for the total eclipse, where they may see “amazing phenomena” like the diamond ring, shadowbands, crescent-shaped solar images under trees (instead of the usual ‘coins’ which are pinhole images of the sun), and extremely sharp shadows in the final minute before totality, due to the very narrow sun at that time. “These phenomena can only be seen in totality,” she says. The next chance to see a total solar eclipse will be in 2024, when its shadow will be cast closer to Connecticut. It will start in the U.S. in Texas, then make its way north, through northern Vermont and New Hampshire. For those on campus next week, you aren’t out of luck. For this eclipse there will be a viewing party on Horsebarn Hill behind the Dairy Bar, from 1 to 4 p.m., hosted by the Department of Physics. “We’ll have solar telescopes, a pinhole camera activity, and will do some short mini-lectures on astronomy at UConn and about how eclipses work,” says Assistant Professor of Physics Jonathan Trump, one of the faculty members who will lead the viewing party. The eclipse will be live-streamed by NASA, and can also be viewed on PBS’ NOVA at 9 p.m. on Aug. 21. 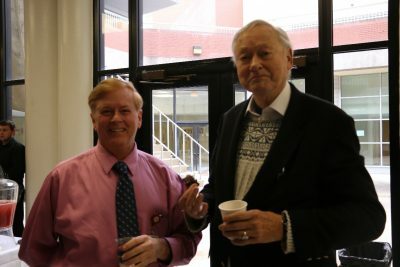 John Mangeri (left) with his SCGSR-award host Dr. Olle Heinonen (right) in front of the Chemistry building (bldg. 200) at Argonne National Laboratory. John Mangeri, a Ph.D. candidate in Dr. Serge Nakhmanson’s “Complex Materials by Computational Design” group, was selected to receive the U.S. Department of Energy’s Office of Science Graduate Research (DoE SCGSR) award for his project, Computational Design of Functional Materials for Electrothermal Energy Interconversion on Mesoscale. This award allowed John to conduct research on his project at the Argonne National Laboratory in Lemont, IL, for from June to September in 2016 under the guidance of the DoE collaborator, Dr. Olle G. Heinonen. Argonne National Laboratory is one of the U.S. Department of Energy’s premier national laboratories for scientific and engineering research. Its state-of-the-art, high-performance computing facilities that were available to John during his visit enabled him to achieve rapid progress in advancing his Ph.D. project. “I am extremely pleased with John’s research accomplishments on the way to his Ph.D. degree. John is currently the main code developer for the mesoscale-level multiphysics simulation package, ‘Ferret,’ that is being utilized by the group together with our Argonne collaborators to design new materials that can convert thermal energy into electrical and vice versa,” Dr. Nakhmanson commented. John’s research on a new material concept for this energy conversion by utilizing an electrocaloric effect that changes the temperature of a dielectric when subjected to an external electric field was recently published in a new journal, NPJ Computational Materials, that is partnered with the prestigious scientific journal Nature. The article, entitled “Amplitudon and phason modes of electrocaloric energy interconversion,” was co-authored by John, Krishna Pitike (also a graduate student in Dr. Nakhmanson’s group), Dr. Pamir Alpay, and Dr. Nakhmanson. In that project, the co-authors conducted a theoretical investigation of a model system made up of thin perovskite-oxide crystal layers, whose polarization directions can be easily reoriented by an applied electric field. This unusual system, the team demonstrated, must exhibit two different kinds of electrocaloric responses, conventional and anomalous one, that can either heat the material up or cool it down with a capability to switch between these two modes on demand. Possible applications for this effect are new, integrated cooling sources for computer chips and other electronic circuits, as well as more efficient and silent HVAC devices. “The effect we saw was quite unexpected. 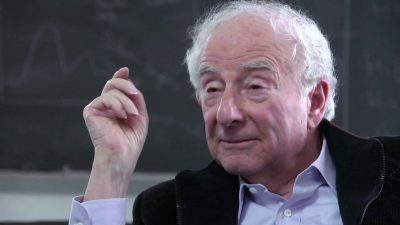 We were able to show that there are two kinds of energy conversion modes in that material — stemming, respectively, from either amplitudon or phason excitations of the local polar dipoles,” John said. Even though this material does not yet exist, he further explained, quantum mechanics suggests that it could be put together by one of atomic layer-by-layer deposition techniques that are utilized for growing thin oxide films on substrates.